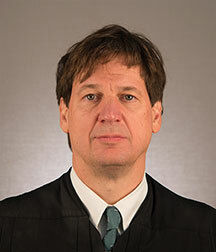 Common Pleas Court Judge Charles J. Kubicki Jr. Honorable Charles J. Kubicki Jr.
To set a hearing on a motion, contact the constable for civil cases and the bailiff for criminal cases. A file-stamped courtesy copy of the motion should be provided to the Court. The motion should, on the first page, be very precise as to what it pertains. For example, a plaintiff’s motion for summary judgment should reference each claim in the complaint for which summary judgment is sought (e.g. 1st claim, breach of contract). Copies of the key cases upon which a party relies should be attached to the motion. Hearings will be scheduled Monday through Thursday — mornings for criminal and afternoons for civil. The Court will, on its own, set a hearing on a case-by-case basis. The Court will strongly recommend ADR in order to give the parties the opportunity to resolve the case themselves (rather than strangers) and, if nothing else, to eliminate any miscommunication between the parties and to assist the attorneys with preparing and evaluating the case in a timely manner. Anyone can raise the issue of settlement — the Court certainly will. At pretrial, the parties, if not present, should be readily available to discuss settlement. With criminal cases, the Court, without making any promise or commitment, will generally indicate whether any plea-bargain reached between the prosecutor and defense counsel seems reasonable (subject to the PSI). Counsel should contact the law clerk (civil cases) or the bailiff (criminal cases) for a continuance. A continuance request of a hearing or trial date should be a last resort. Please make a request as soon as the need for one becomes apparent — this will reduce wasted Court time and preparation. An agreed motion for a continuance is preferred. A continuance of a trial date will only be granted by the Court (not the bailiff or law clerk) after a consultation with the court and only in exceptional circumstances. A pretrial conference will be held in every civil case (usually one month before trial). Counsel should be familiar with and prepared to discuss the topics listed in the civil and local rules regarding pretrial conferences. Counsel should especially be prepared to discuss the pretrial statement, jury instructions, evidentiary issues, and settlement. All pretrial statements shall include, among other things, the factual and legal issues, witness list, exhibit list, length of trial, joint-proposed jury instructions, evidentiary stipulations as to exhibits and experts (qualifications and foundation-related matters). The Court prepares criminal jury instructions using Ohio Jury Instructions. For civil cases, attorneys are required to prepare joint-proposed jury instructions. To expedite the trial, counsel is also expected to meet, mark and stipulate to the admissibility of all trial exhibits prior to trial. Only pre-approved exhibits may be used during opening statements. Attorneys are expected to address any anticipated evidentiary issues prior to trial through motions in limine. Trial briefs are required. Although there is no set time limit for voir dire, a jury is expected to be impaneled in a half-day. All deposition and video testimony is to be reviewed and edited prior to trial. Counsel should have copies of video testimony and/or depositions available for trial in case such items are not found in the case file. Discovery time limits will be addressed in the case management scheduling order. The Court expects the parties to cooperate and be reasonable in all discovery matters. The parties should make every effort to resolve any dispute between them. The Court should only be involved as a last resort. Nevertheless, if the parties cannot resolve a discovery dispute, counsel should involve the Court before the issue affects the trial date. Attorneys should be courteous and professional to everyone. Counsel should check in with the law clerk (civil cases) or bailiff (criminal cases). If a trial is in progress, courtroom staff will, to the extent possible, try to meet counsel immediately outside the courtroom. During trial or a hearing, counsel may stand anywhere reasonable as long as he/she can be heard by everyone involved. Counsel should seek permission to approach a witness. Counsel should stand when addressing the Court or jury. Counsel should contact courtroom staff at least one day prior to the trial or hearing as to any audio/visual or other equipment needs. Counsel should be professional, punctual, prepared, reasonable, courteous, focused and succinct. Attorneys should not argue with each other or make things personal. The Court prefers logic, reason, and the law, to loud arguments.